A childhood friend of mine is about to explode into the retail market with his artisan brittle. The flavors are completely unique and the brittle itself has the perfect nut to candy ratio and Buttery crunch that makes a good brittle good. 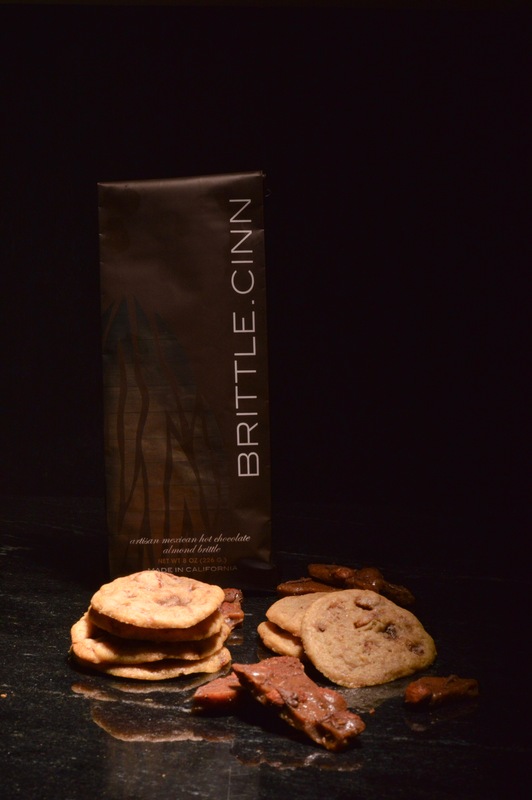 I was particularly inspired by his Mexican Hot Chocolate inspired brittle, brittle.cinn. Their product can be found here brittleca.com now, and everywhere soon! Congratulations Johnathon Singer and business partner Heidi Ostaszewski for what I’m sure will be a massive success! I was inspired to make a cookie with this brittle. A chewy, brittle filled number with a bit of cinnamon and a pinch of cayenne. This cookie is SO good. Make it. Of course you can use any brittle you like, but the flavor profiles in this cookie meld with this brittle perfectly. Whisk together flour, baking soda, cinnamon and cayenne in a bowl and set aside. In the bowl of a stand mixer, cream together butter and sugars until fluffy. Beat in salt, vanilla and eggs until combined. Slowly add in flour mixture until just incorporated and stir in brittle chips. Drop small spoons full onto a parchment lined cookie sheet with several inches between to allow them to spread. The more perfect your cookie dough balls are, the more perfectly round your cookies will be. Bake at 350 degrees for 8-10 minutes until they begin to brown on the edges. Remove to a wire rack to cool. These cookies and this brittle will NOT disappoint!